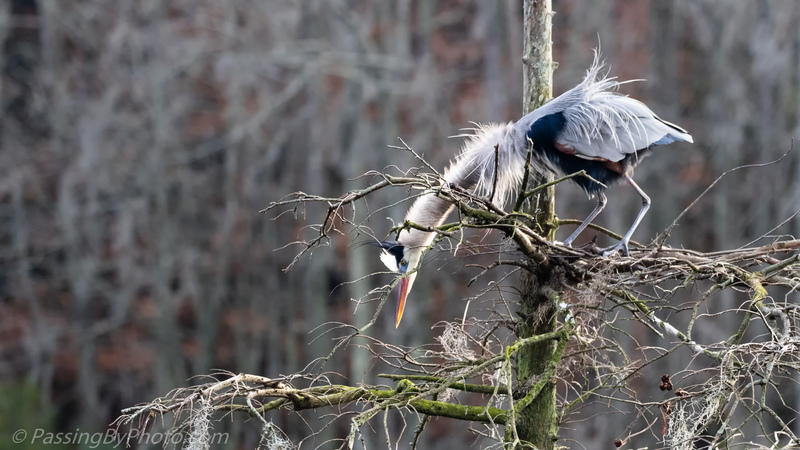 This Great Blue Heron opted to choose some nest building materials from the tree line where I was standing. 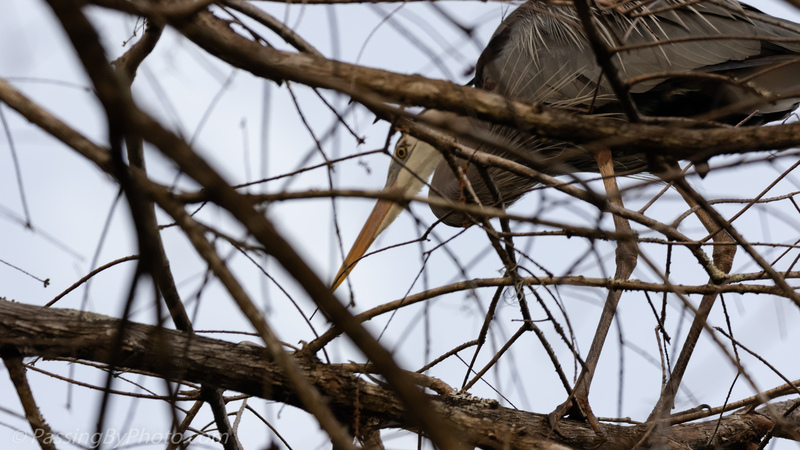 After a tricky landing he walked along a good sized branch while poking for loose material. 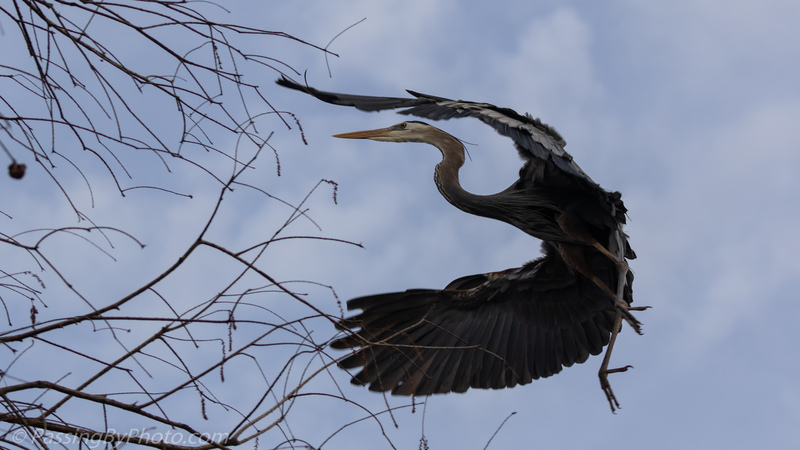 After discarding a few options he pulled an acceptable branch free and flew back to the nest. 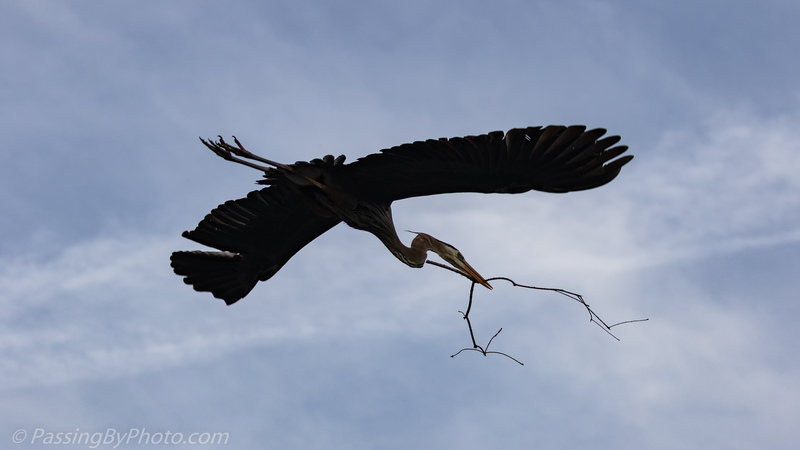 The Great Blue Herons are busy fixing up their nests around the pond, one stick at a time. 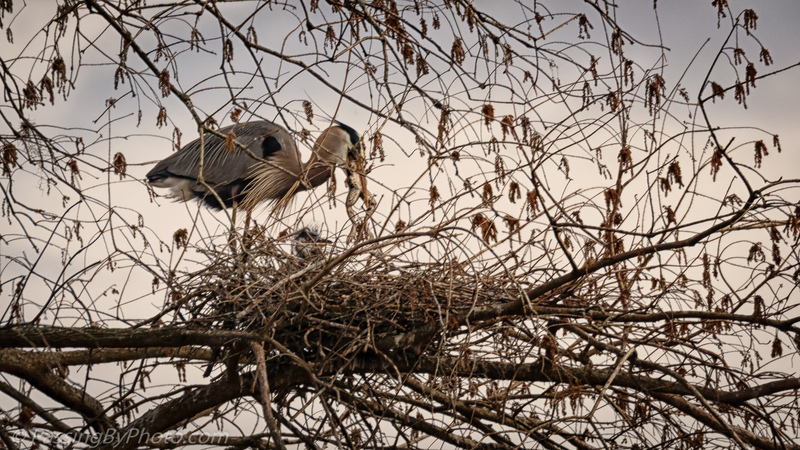 Great Blue Heron chicks have started to hatch around the rookery and Tuesday I spotted one in a high nest sticking his head up. The first few days the adults will tear food apart and give it to their chicks. As the chicks grow, which happens pretty quickly, the adult dangles food in front of the chicks encouraging them to grab their own meal. 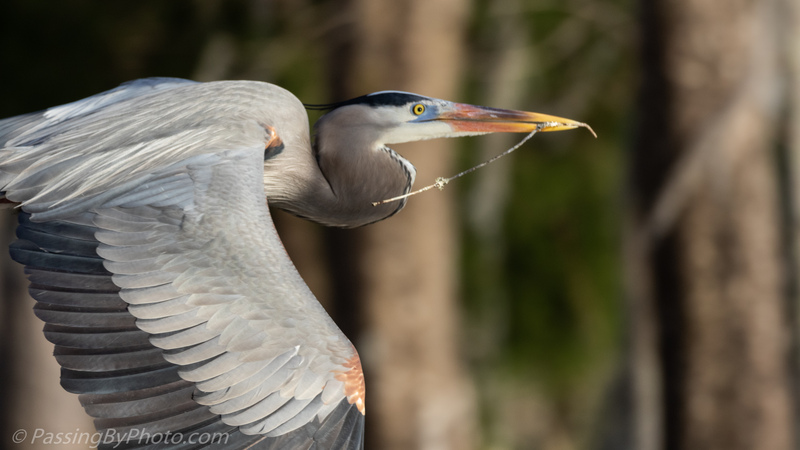 Either this chick couldn’t figure out how to get a bite of frog or wasn’t hungry, but after a minute or so the chick lost his chance. It took a minute or so of concentrated effort, but the adult ate the frog in one bite. 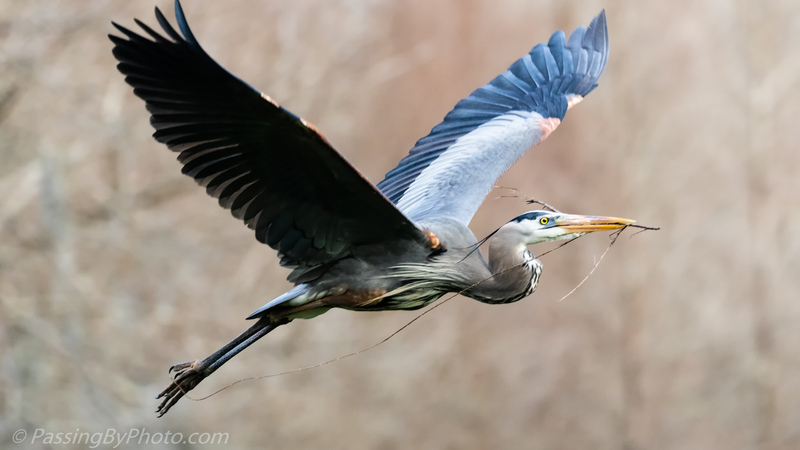 We are at that time of year when there is a lot of Great Blue Heron activity in the swamp at the end of the day with last minute nest building, one mate returning to the nest after feeding, and new-comers looking for a spot. Unfortunately the sun has dipped below the tree line and there is very little light to capture the action. So silhouettes are an interesting option. 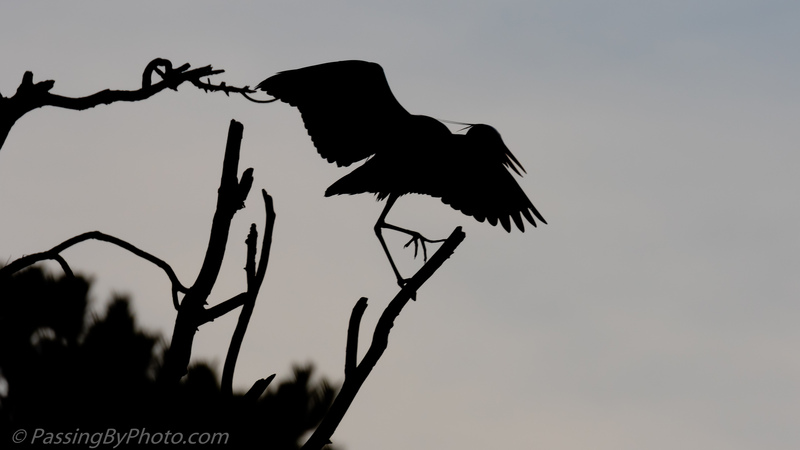 I particularly like this next one with the heron’s foot flexed. 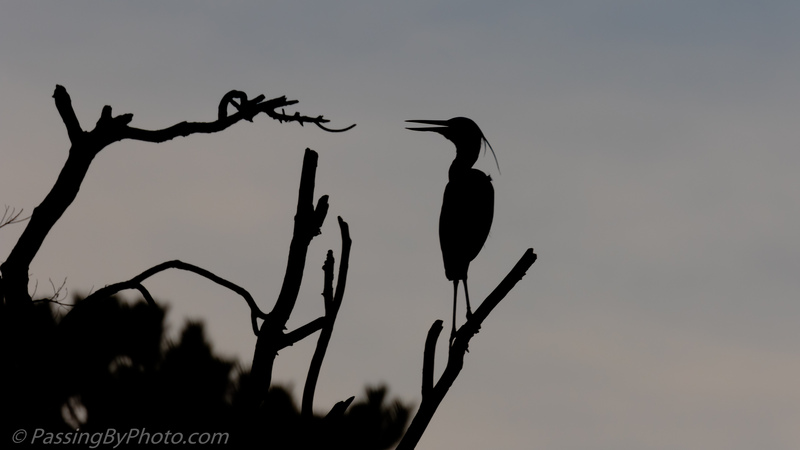 This heron settled down, probably wondering where to spend the night. 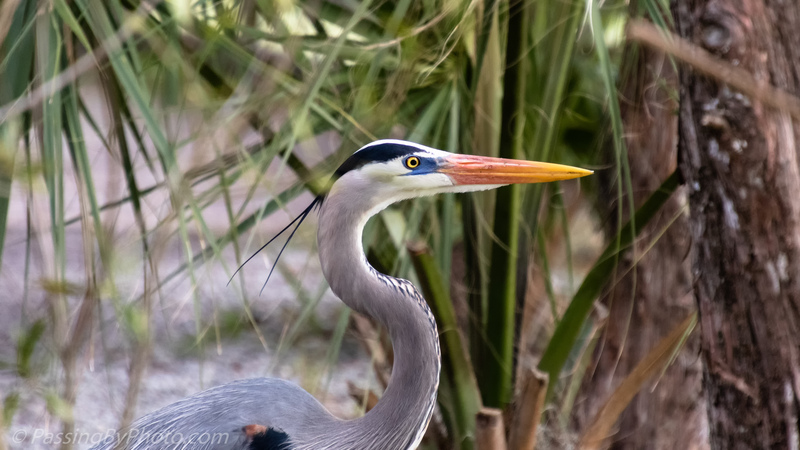 Not all of the singles are paired with a mate yet with a nest to return to. 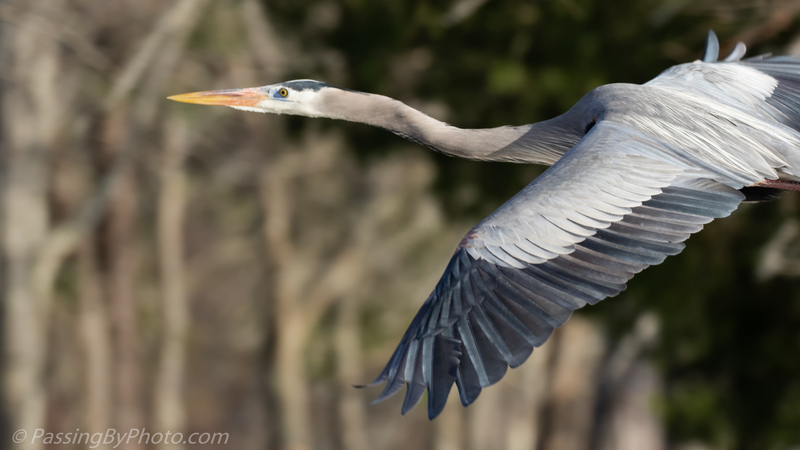 The Great Blue Herons are the most affectionate of the wading birds I have observed as they prepare for having a family. 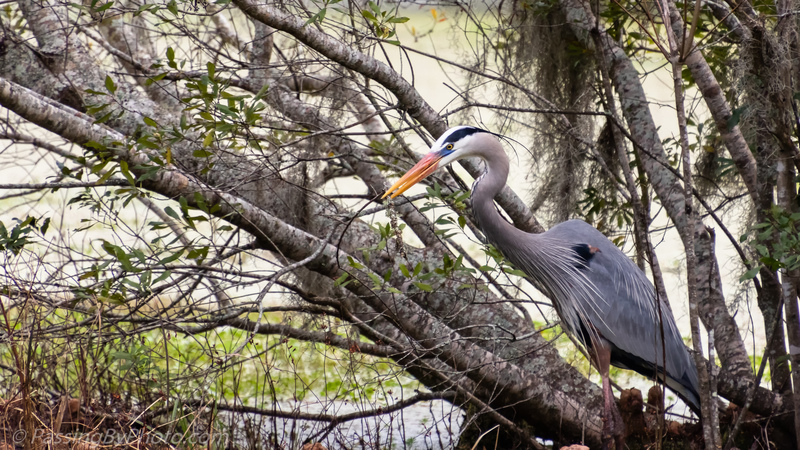 They often take time to nuzzle, bird-style, between nest material gathering runs. 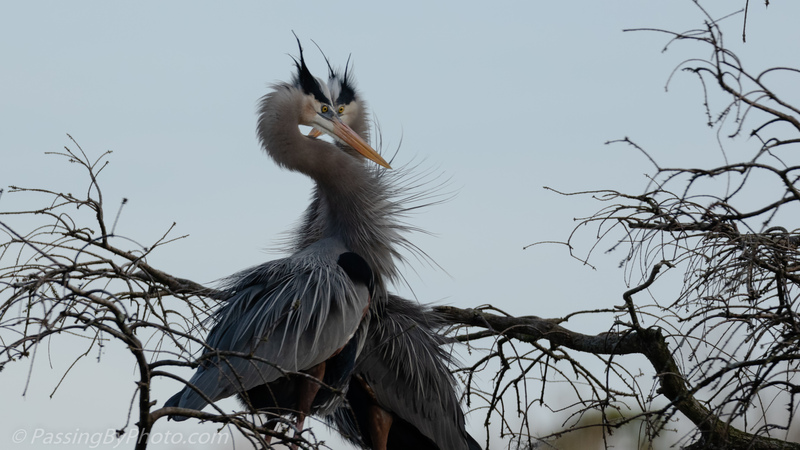 I’ve featured GBH antics in the “skinny tree” previous nesting years. 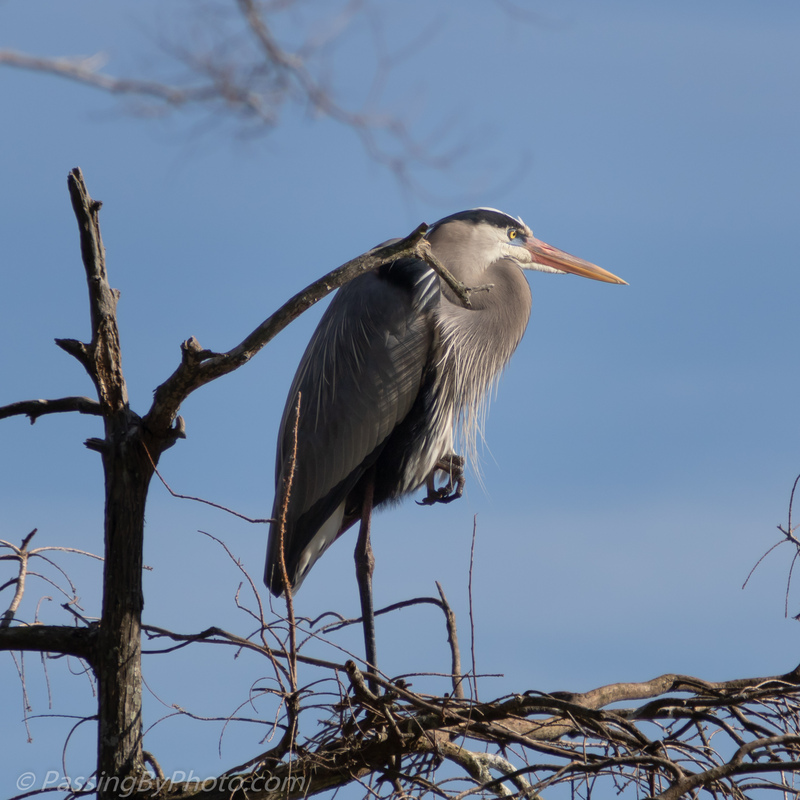 These images were taken in late December, on a grey day, as a Great Blue was staking a claim to this coveted nesting spot. 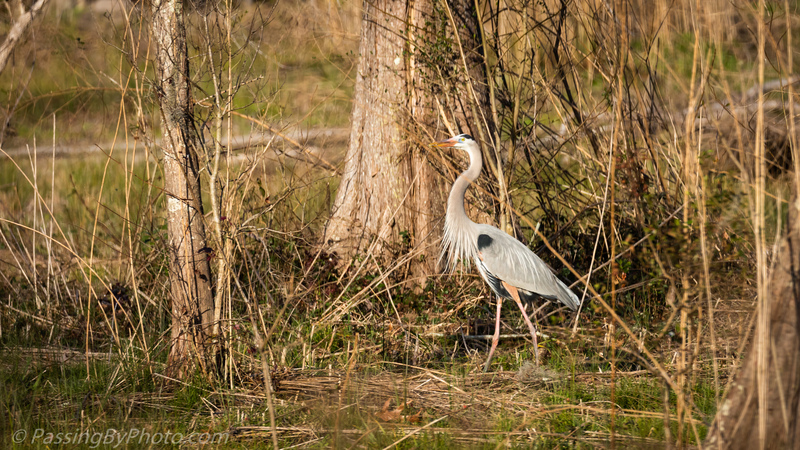 The tree is free standing in the pond, reducing the likelihood of predators arriving from below. First order of business is to attract a mate. 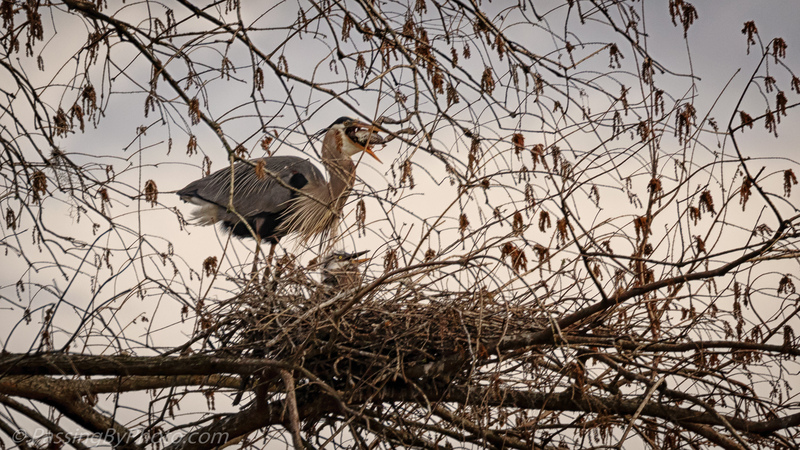 None of the nesting material from last year survived and more of the tree has broken away. 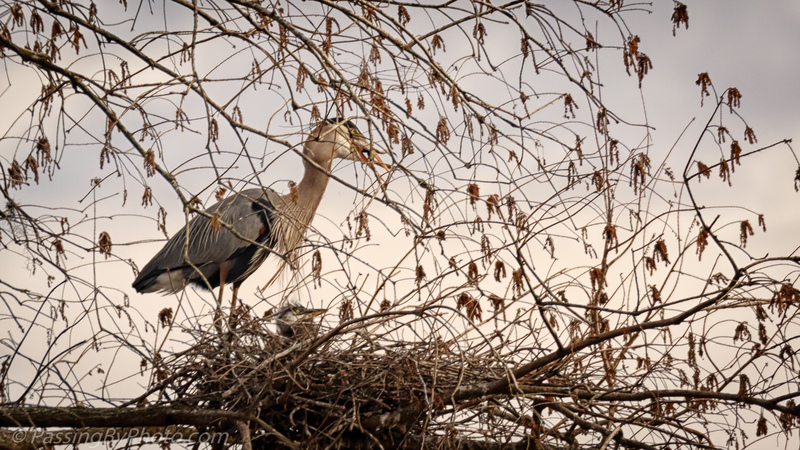 This adult and the selected mate will have a lot of work to make a viable nest. 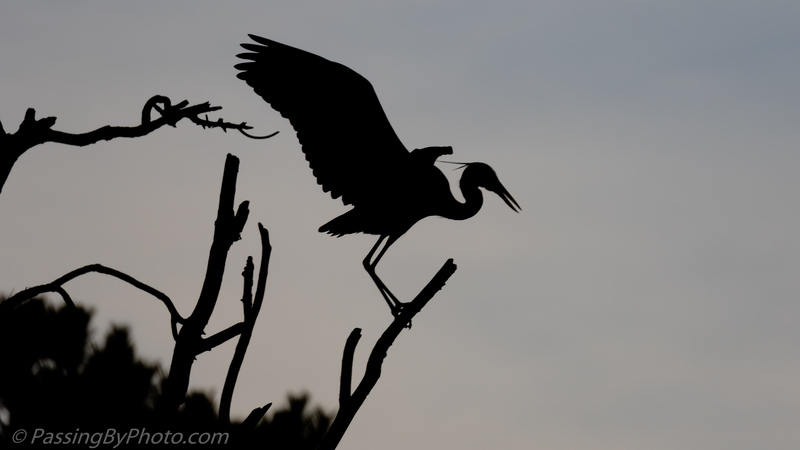 In the last image the heron is performing a downward stretching and beak snapping behavior. 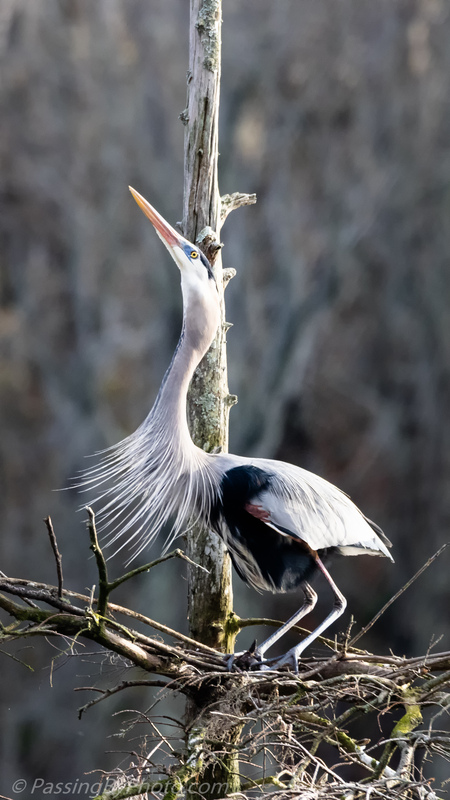 There were a few other GBH around the pond, some working on nests in trees on the small islands, but none seemed impressed by this show. 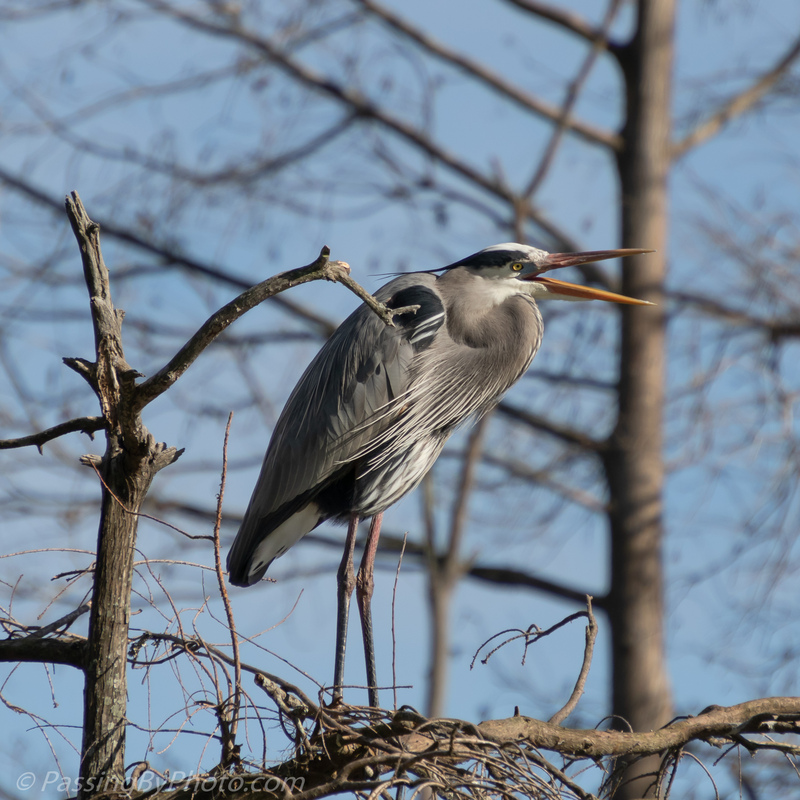 A small number of Great Blue Herons are busy building nests around the swamp. 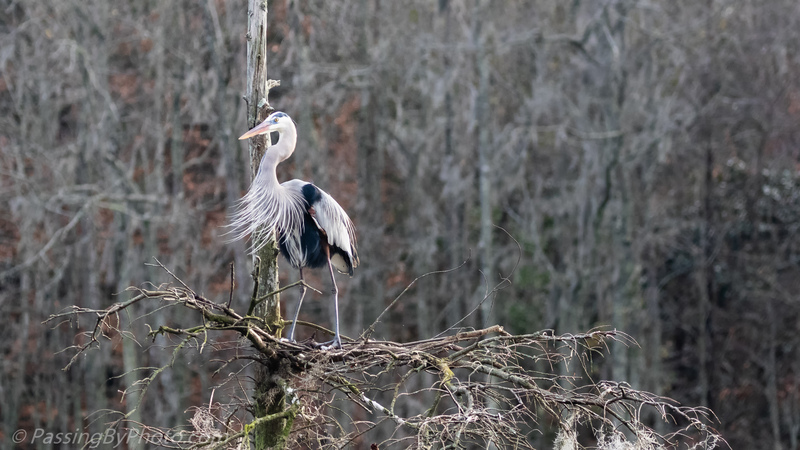 This one landed on a small island to look for nest building material. 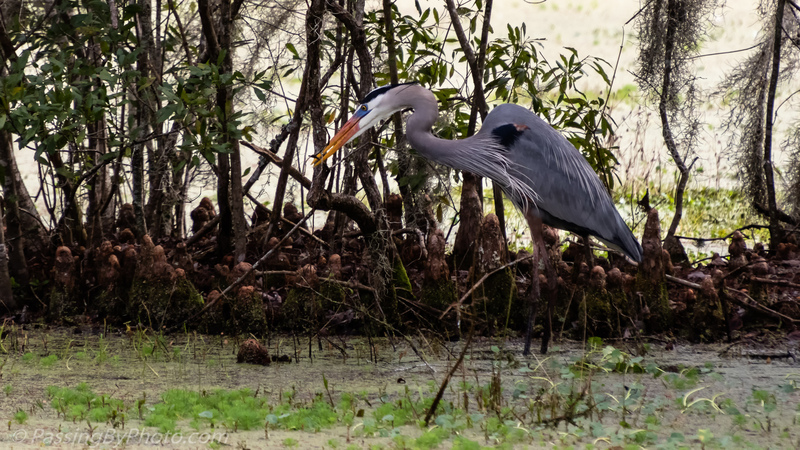 He just couldn’t find the right stick, selecting and discarding all sizes as he traipsed between the Cypress knees. 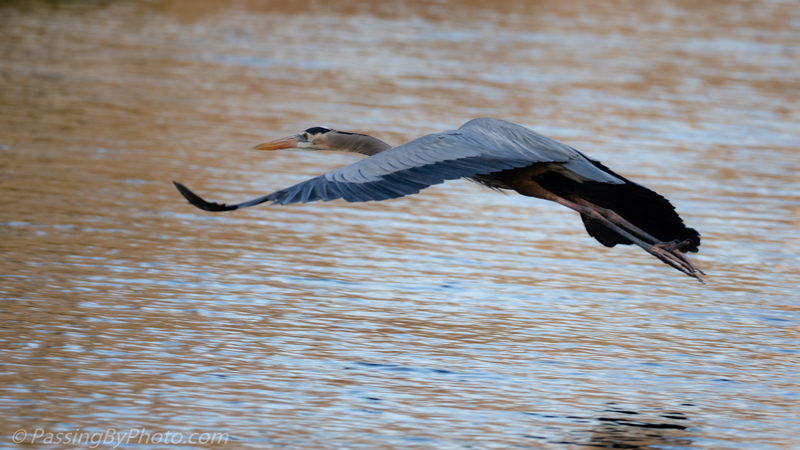 I finally gave up hoping to see him fly with a stick; he was still poking around when I moved on.